Thanks for posting that, mariasmon. Very unfortunate. At least as of now, there's no death report for Zenyatta. Fingers crossed she's fine. Odd there's been no announcement on her website. Her fans must be very concerned. I was also concerned that there has been no updates on the filly either. Glad that report shows that the filly is still alive! I don't think it happened recently. My feelings are it happened sometime before her birthday pictures. I just say this because I saw pics of her from February and to me, she looked bigger than her birthday pictures. The rule for reporting "no foal" with the Jockey Club is, you only have to do it within 30 days of when the mare was supposed to foal. So she could have aborted in February/early March and we only hear about it now because this is around when she should have foaled. Sparrow Castle wrote: Thanks for posting that, mariasmon. Very unfortunate. If I understand you correctly, you mean a death report for Zenyatta herself, not her 2018 foal. If so, then I believe you should not be concerned about Zen, because if she had died it would be a big story in the racing media. That there is no such report probably means she's fine. Her human connections probably are not though, given the circumstances. I could be wrong but did they not breed her TWICE as first did not take - slipped? Equineline wouldn't say she aborted the foal if she was still pregnant. If she slipped early in the pregnancy and got back in foal, they wouldn't even note the first foal that was lost. Wasn't her due date around the 11th May? Plus she's always a few days late. If she aborted she gets this year off, no biggie. So, she aborted before her birthday, April 1? Kurenai wrote: Wasn't her due date around the 11th May? Plus she's always a few days late. If she aborted she gets this year off, no biggie. https://thecasualgalloper.com/2018/03/1 ... -realized/ - photos taken in February. to me she looks bigger in the one pic here than she does from any of her birthday pics. Regardless. They wouldn't note that she aborted a foal unless it was late in her pregnancy. Equineline/Jockey Club only takes note of that if there is going to be NO FOAL at all. It doesn't matter if she was bred to Into Mischief and slipped and then was rebred. They would only take note of the 2nd time. If there is a Broodmare Aborted listing on Equineline, there is no foal to be born this year. Flanders is there ever a distinction between a foal born too early/stillborn and "aborted"? Could it maybe have been fairly recent, like the last week or two? lurkey mclurker wrote: Flanders is there ever a distinction between a foal born too early/stillborn and "aborted"? Could it maybe have been fairly recent, like the last week or two? The terms are interchangeable but its late term when those are used. Otherwise they use the term Slipped. So yes it could have been in the last 2 weeks. Hall of Fame racemare Zenyatta's run of bad luck as a broodmare continues as, according to Equineline, the mare aborted her pregnancy to the cover of successful sire Into Mischief and thus will not have a foal in 2018. Since being retired in time for the 2011 breeding season, Zenyatta has had only two foals to survive to racing age thus far, neither a winner on the track. Her first foal, Cozmic One, by Bernardini, went unplaced in five starts. He is now training as a hunter-jumper, aiming for the 2018 Retired Racehorse Project Thoroughbred Makeover. In 2013, Zenyatta produced Ziconic, by leading sire Tapit. He currently sports a racing record of 12-0-2-6; he last raced on Feb. 9, and last had a published work on March 13. 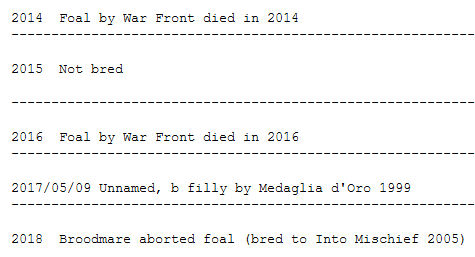 Zenyatta produced a filly by War Front in 2014, and was not bred back for the following season. The filly suffered an injury that proved fatal in a paddock accident later that fall, after she was weaned. Zenyatta delivered a War Front colt in 2016, who aspirated meconium during delivery, and survived only a few days. Zenyatta delivered a Medaglia d'Oro filly on May 9, 2017 before being bred back to Into Mischief. The filly, now a yearling, has been reported to be in good health. She is boarded at Lane's End, where Zenyatta also resides. So... one would assume DRF confirmed with Lane's End before publishing, or would they just post a "hey look at what's on Equineline" piece without that extra confirmation? This is not meant as a challenge, but other sites have stated she slipped the first cover and was rebred. She looked pregnant in photos in April. Has it been confirmed she lost the foal since then? Just seems like a lot of conflicting information out there. If true, very sad. Equineline shows official records with The Jockey Club - and only lists the ULTIMATE result of the season (not mares slipping early/rebred, not catching on first cover, etc). Information appearing there is information filed with TJC by connections. And DRF answered that pretty definitively... thanks Flanders & SC. Such a shame. Isn't it common for breeding contracts to include a "Stands & Nurses" clause? If there was in Zen's case, I presume she has the option to return to him next season to be re-bred. I hope that happens, as I thought Zen's size/stamina with Into Mischief's speed/precocity was a good combo. I also hope Z's MdO yearling filly has armed equine paramedics keeping an eagle eye on her, because she is rather rare and precious. Last edited by BaroqueAgain1 on Thu May 10, 2018 2:35 am, edited 1 time in total.